The purpose of this blog is to uncover facts, research and perspectives which have been overlooked, ignored, excluded or “censored” by alternative and mainstream media – with particular emphasis on Iraq mortality studies. I’ve also added several entries criticising Medialens. These complement pieces I’ve written for ZNet, Comment Factory and Media Hell, which catalogue errors and misrepresentations in Medialens’s output. (In response, Medialens’s “editors” have consistently resorted to name-muddying slights, rather than address my criticisms – a fact noted by George Monbiot). 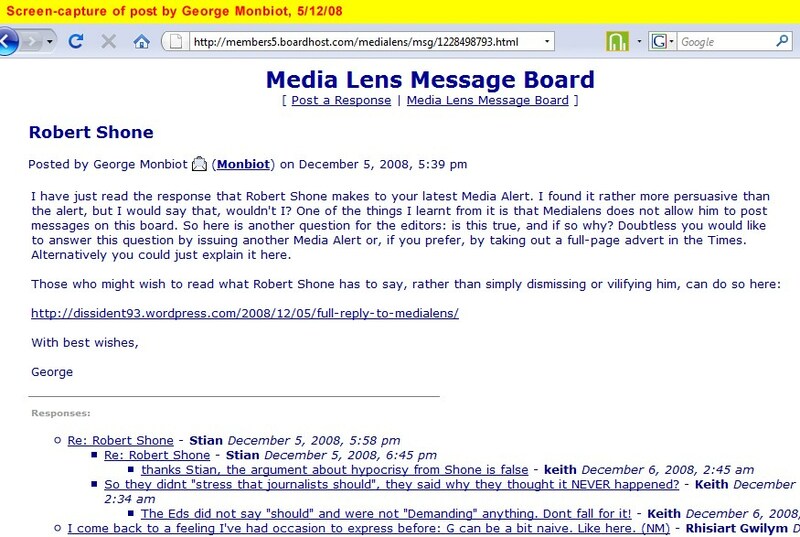 Motivation for the Iraq mortality material comes from my observation that many “alternative” media commentators (at ZNet, Alternet, PR Watch, etc) regularly make basic errors when commentating on Iraq death estimates (an almost universal error is their claim that the Lancet studies estimated “civilian” deaths, when in fact they included both combatant and civilian deaths. Another is that IFHS produced an estimate of total excess deaths for all causes, when in fact it estimated only violent deaths). These commentators (and they are legion) also circulate a misinformed mythology – eg that Iraq Body Count includes only deaths reported in “Western” media, and that the Lancet studies produced the only “scientific” estimates (mentioning no names for that last gaffe, but if you’re going to give yourself a grand-sounding title such as Just Foreign Policy, you should at least do a minimum amount of research). Email/Contact: Please use the form below to contact me.